Not humans. If they’re going to be munching on something, it will be a plant to get the nutritious juices inside. The brown stink bug is an insect not previously seen on our continent. It was apparently accidentally introduced into eastern Pennsylvania and was first collected in September of 1998 in Allentown, likely on a ship from Asia, but probably arrived several years earlier. 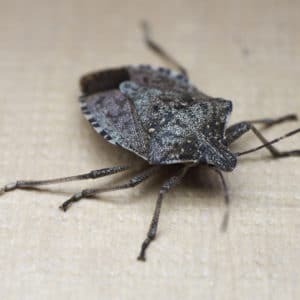 Stink bugs are like skunks of the insect world. The scent they emit is a distress signal. Do stink bugs spread disease? No! They are truly pesky pests for humans. Do they harm the environment? In 2010, it produced severe losses in some apple and peach orchards by damaging peaches and apples. It also has been found feeding on blackberry, sweet corn, field corn and soybeans. In neighboring states it has been observed damaging tomatoes, lima beans and green peppers. Green Pest Solutions knows Stink Bugs. And we know how to kick them out. Call us today at 877-636-9469 for your stink bug problems and any other pest issues. We serve Pennsylvania, New Jersey, and Delaware.